Our friends over in the Philippines will finally get to see the latest Pokemon film on the big screen! 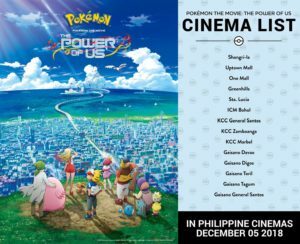 Pokemon the Movie: The Power of Us is set to premiere on 5th December 2018 in the Philippines. The movie will be screening on select theaters nationwide. The Pokemon Philippines facebook fanpage shares a detailed list of participating theaters.